It’s time for the Lizzadro Museum of Lapidary Art’s annual Dino Day on Saturday, January 5, 2019, from 10 a.m. to 4 p.m. This family-friendly event is appropriate for everyone ages 5 and up. Moms and dads, you’re invited to participate too! You and your children can examine real fossils, build 3-D dinosaur puzzles and even play dinosaur bingo. All of us at Elmhurst Toyota appreciate the many educational programs that the Lizzadro Museum offers for families and children, and we think you’ll enjoy Dino Day. Even though dinosaurs disappeared from the Earth millions of years ago, we know what they might have looked like, thanks to their fossilized footprints, bones and teeth. 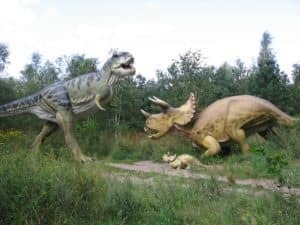 Paleontologists, the scientists who study ancient life, are able to use these fossilized clues to determine how big dinosaurs were, whether they were meat-eaters or herbivores, and what their environment was like. At Dino Day, you and your kids can pretend you’re paleontologists as you take part in fun activities like putting together a 3-D dinosaur bone puzzle or looking at fossils that are millions of years old. Play dinosaur bingo at 10:30 a.m., 11:30 a.m. or 1 p.m. for a chance to win fossil prizes! Your children can make imprints from real fossils to take home with them as a souvenir of Dino Day. The Lizzadro Museum has a large collection of animal and plant fossils on permanent display. They even have the remains of a Tully Monster, the official state fossil of Illinois. You can see the fossilized remains of this strange-looking marine animal that lived in Illinois approximately 308 million years ago, when the region was covered by a warm, tropical ocean. Stop by the Lizzadro Museum for Dino Day any time between 10 a.m. and 4 p.m. on Saturday, January 5. You don’t need to make reservations or buy tickets in advance. All Dino Day activities are included in the $5 per person admission fee. We hope to see you there! Saturday, January 5, 2019, 10 a.m. to 4 p.m.